Since yesterday was Cinco de Mayo, I thought it fitting for this post. My mother-in-law made this once for a RS Birthday dinner and the whole family uses these recipes again and again. They are all so yummy! 1 pkg. Good Seasons Zesty Italian Dressing mix, prepared as directed. Mix together, serve with chips, ENJOY! Place ingredients in a greased slow cooker. Cover with lid and cook on high for 6-8 hours until pork begins to fall apart. Shred pork using two forks. 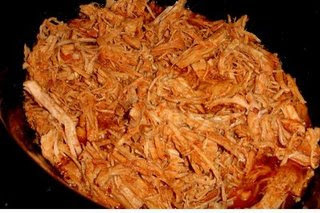 Do not drain liquid, it will be absorbed back into the shredded meat. Add 1 additional cup of salsa. Season with salt (1-2 tsp.) and pepper to taste. Turn crock pot to warm or low. Use meat in burritos, tacos or salads. 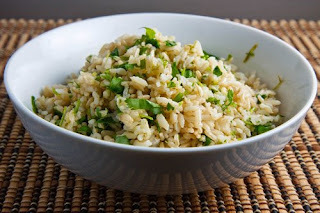 Combine into saucepan and cook until liquid is absorbed and rice is tender, about 20-30 minutes. Remove from heat. Mix together in a bowl, pour over rice, mix together, and serve. 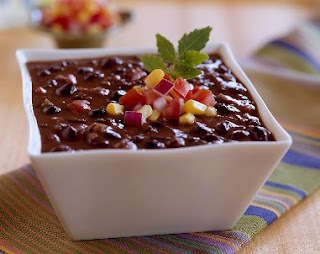 Soak black beans overnight and cook as directed on pkg. Drain and rinse beans in a colander. In a non-stick skillet, cook garlic and cumin in olive oil over medium heat for a couple of minutes, stirring constantly. Add beans, tomato juice, and salt. Continue to stir until heated through. 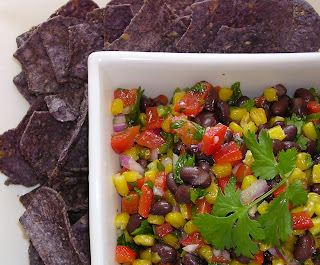 (Can be put into a crock pot on warm or low) Just before serving stir in chopped cilantro. Mix together in blender until smooth. Refrigerate.